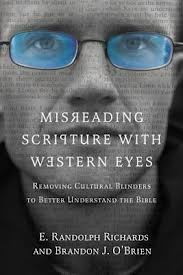 I want to continue on with my series of engaging with Randolph Richards’ and Brandon O’Brien’s book, entitled Misreading Scripture with Western Eyes. If interested in the 2 previous posts, here is the preview and here are my thoughts on chapter 1. I was also interested to find that Internet Monk is carrying a similar series. Read their part 1 and part 2 thus far. Chapter 1 was all about the mores (pronounced mawr-eyz) of the ancient biblical world. These are simply the fundamental moral values of a group that go without saying. Chapter 2 is about race and ethnicity. And just a reminder that we are still at the ‘tip of the iceberg’, meaning these are issues that are quite easy to perceive in noting the difference between the perspectives of the ancient near east (those of biblical times) and the modern western world. While we live in a world where most argue that all people are equal, regardless of race or ethnicity or gender, such was not true of those we read about in Scripture. One of the biggest examples brought to the surface by Richards and O’Brien is that of Moses and his wife (Zipporah). The problem with Moses’ wife is her ethnicity, as made clear in Num 12:1 – Miriam and Aaron began to talk against Moses because of his Cushite wife, for he had married a Cushite. And it’s not so much that this ethnic ‘problem’ goes unnoticed, but rather that it’s noticed for the wrong angle. You see, Cushites lived in the southern Nile River valley, meaning they were dark-skinned Africans. Knowing the history of the western world and the use of black Africans for slavery (though this is far from our perspective now), we suppose that Miriam and Aaron are raising an objection because Moses is marrying beneath himself. Moses, you think your so good. You didn’t live under slavery like we did, since you lived in the Egyptian palace for 40 years and then escaped Egypt for 40 years. Now you’re marrying a Cushite. Are you so special?! Has the Lord only chosen you as his prophet?! Of course, the argument is that, in the New Testament, every racial and ethnic division has been obliterated in Christ (considering passages like Gal 3:26-29). And I agree with such a paradigm-shift, which I’ve brought to the forefront in discussion involving women in leadership. But, within Scripture, there is a kind of tension at times, one where we read one perspective in a particular passage and then an almost opposite perspective in another passage. Yeah, it’s really there – the kingdom of God is here now and the kingdom of God is to come in the future; women can pray & prophesy out loud when the church gathers and women must remain silent; God will reconcile all things to himself and God will judge the wicked; etc. It keeps us humble as we seek the Lord and study Scripture. And, so, with regards to race and ethnicity, though we approach things from a very modern, politically-correct perspective (and I think such is healthy), we can identify some ethnolinguistic markers throughout Scripture. The authors of this book point out quite a few from Acts 21-22 alone. Though we might miss or push them out of our sight, these would have been clear racial and ethnic indicators to those of the first century. It’s not unlike a well-educated person from the north remarking that his intellectual competitor has come from Mississippi. It’s likely that such intent involves communicating that the challenger has come from an uneducated background. It’s not unknown – and I can attest to this coming from Memphis, Tennessee, just on the border of Mississippi. Those from the state of Mississippi could even find themselves as the brunt of a joke from Tennesseans. Another instance I’ve always found amusing is that of Pentecost, in Acts 2. What we have here is a bunch of people from Galilee speaking languages they’ve never learned. You’ve got a host of visitors from outside the land that are amazed by this feat. But how do we know these tongues are unlearned? Because the speakers are identified as Galileans – they are ‘northerners’, if you will. Their accent (or their ‘twang’) gives them away. And it might be an uneducated accent at that. And remember – Jesus came from Nazareth! Ok, not your most well-mannered of responses, to say the least! Again, this is no shocker, really. And I am aware that many Christians might respond by saying: Well, the Bible never affirms this kind of racial or ethnic designation. Thus, Scripture as God’s word, does not support racism. I’m not here to advocate that Scripture, or God, approves of any kind of racism. I suppose it’s difficult to argue that the Bible never asserts racial dividers in its pages. But, the whole point is to note that a) there are racial and ethnic markers within holy Scripture and b) that sometimes these markers are in quite a different direction than we first imagined. When approaching the text, we need to allow the text to highlight its own perspective and details, rather than imposing our modern, western Christian perspective onto the text. Still, we won’t be able to do this with any extreme accuracy. So it might be helpful to invest in some tools that help bring out the details of an ancient world (rather than a modern world) and an eastern world (rather than a western world) – maybe this book is a starter. But this is the setting in which God chose to have his Scriptural revelation come forth. It is not an abstract, ethereal text free from such perspectives. And this great revelatory text, the incarnational Scripture revealing God through his finite and fallen creatures, should be loved for what it is, not what we wish it were. I’ve come to appreciate the real earthiness of the Bible. This entry was tagged Bible, book review, books, hermeneutics, Scripture. Bookmark the permalink. I didn’t even know that thing about Moses, his wife and the Cushites. Eye-opening stuff. I remember an old pop song, Walk Like an Egyptian. It’s almost, like as we read the Bible we need to THINK like an Egyptian, or a Roman, or a Jew, or a Galilean, or a Corinthian, etc., etc.We see so much more clearly what is being said when we hear it through the ears of the intended audience. It’s just takes some more time to learn their perspective, their “worldview” as it were..
Thankfully the most important part of scripture, the story of Jesus and His redemption of us, transcends cultural boundaries (well, at least MOST cultural boundaries). It’s that thing that brings all out different mores and cultures together under the banner of Christ. It’s interesting to reflect on the reality that the work of Jesus was even within a specific socio-historical context. It’s hard for me to grapple with that Scripture is not so ‘abstract’ or ‘ethereal’ as we first imagined it. I’m not saying that the saving work of Jesus does not include us, but I like what one person said once: The Bible was not written to us, but it was written that we might still benefit from it. Something like that. Even the Gospels were embedded within a particular context. Paul’s letters were written to specific people in specific situations. This is why I’ve found writers who embrace the ‘new perspective’ and the ‘narrative historical hermeneutic’ both satisfying but challenging. I love this. Unfortunately there are many, and some within my own family, who regard such a statement as at best, heretical, and at worst, completly “unchristian”. I’ve never thought of myself as a radical in ANY sense, but in this last year it appears I have become one due to questioning the status quo of hermeneutics. I have actually been told I “may not” really be saved if I don’t believe the traditional evangelical standards of reading and interpreting the Bible. For some it appears it now comes down to “Know Bible, know God. No Bible (as traditionally defined and interpreted), no God.” Why?